My wife was nursing one of the twins while our 2 year old was barfing. It was in a tent and I am sure it was raining, or maybe that was just my mood. This was seemingly the end of tent camping, so we moved from tent life to a camper and then to a sailboat. We were still getting out and enjoying the outdoors, but we missed tent life. When Roof Top Tents (RTT) came around, we were very intrigued. I did a lot of research and found out many tents are made in the same factories, but some do stand out. The Burmis tents are owned and designed here in Canada, so they are familiar with our climate and it shows. Their lineup has 5 tents in it with two main categories, the Sport series and the Guide series. All of the Burmis tents keep you off the ground, away from bugs, dirt, and critters. The views are great from life on top, and the dryness is something those of us on the wet west coast can really appreciate. My experience with the Sport Series is with the Highwood tent. It is a very roomy 3 person and workable 4 person rig. Its sleeping pad was great and larger than a king size bed, with lots of room to play cards, read, or lounge around. The huge doors and windows offer great ventilation so it never felt stuffy, and the window on the ceiling adds to the roomy feeling. One of my initial concerns with the large tent space was how it would handle windy conditions while we were out paddling. In the photo above, the wind was about 20 knots, so quite windy. With no one or no gear in the tent, it would hinge a little, making the ladder lift every now and then. However, there was no damage and with a bit of weight in the tent, I don’t think anything would have moved. I then switched to the Guide Series and tried the Kootenay Guide RTT. This one seemed to fit the bill perfectly. 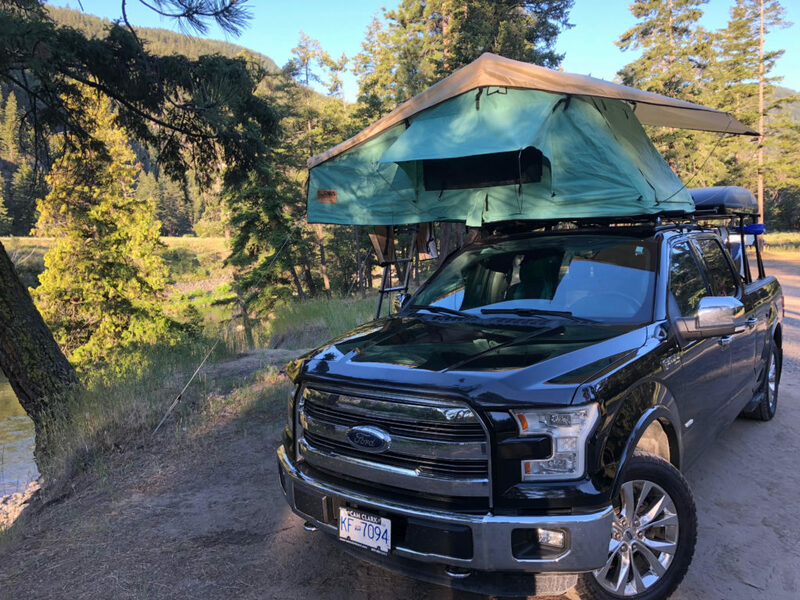 Made with heavier duty materials and just a little smaller than the Highwood, the Kootenay is roomy for 2 and can work fine for three adults. While my Highwood was a great tent and the Sport models are very capable units, it was really nice to move to the Guide Series. The materials are significantly stronger in the Guide Series, a 320 gram vs a 280 gram weight for the Sports. The poles are stronger, wrapped to minimize condensation, and plug into a metal hinge point vs the nylon one for the Sport tents. The sleeping pad is more comfortable, with a 3 inch mattress and a memory foam topper. The sleeping pad even has an anti-condensation mat under the main mattress, keeping everything dry. The two starlight windows make it feel very bright and large, and the roof extends over the ladder for dry entry. There are even footwear bags beside the ladder to keep your shoes dry and accessible. The guy out points make the tent more stable and are annex compatible to give you the option of “downstairs”. Not a term often used in tenting…. It also has a diamond back base plate for added toughness. 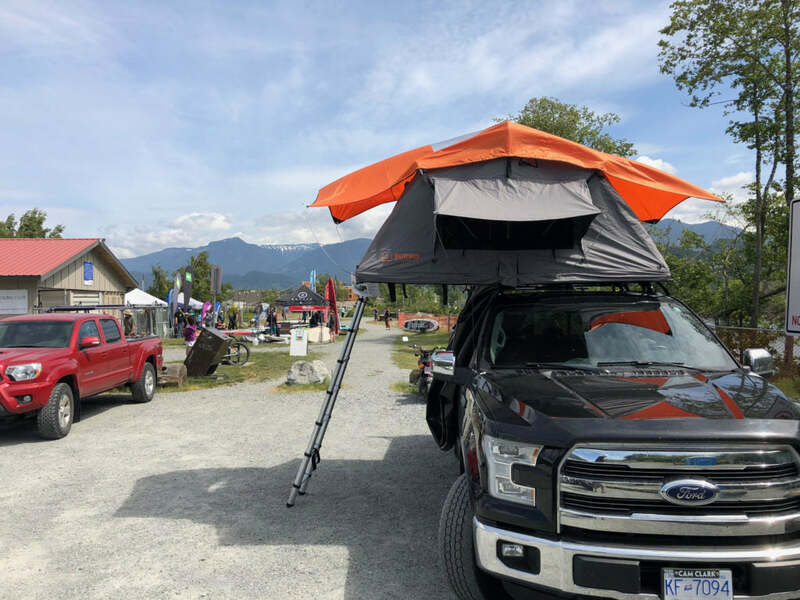 The Kootenay Guide Tent made it across the country and back last summer, and I know it is still going strong with its new owners. If your vehicle has smaller mounts, the Crowsnest is the perfect option. We used one on a Prius and one on a small Mazda last year, and they both worked great. The Sport tents all have the same 280 Gram rips stop materials, poles, mattresses and all, but the Crowsnest has an added starlight window. 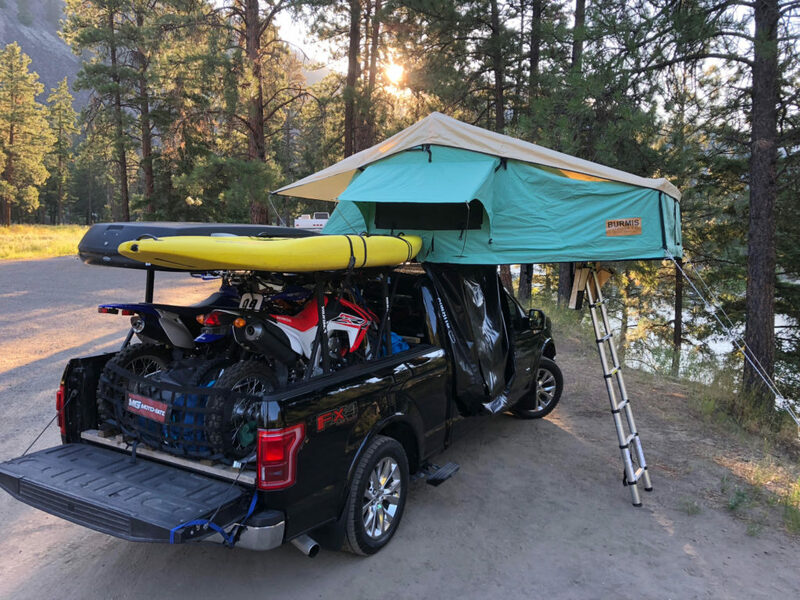 Roof Top Tents from Burmis are easy and fun. Pitching the tent takes moments and once you are good at it, you can put it away just as quickly. I am really looking forward to the slight modifications they have made this year (slightly larger cover, new memory foam pad, and modified awning poles). From testing them out, I know the hardware is great and believe they are the best roof top tents available today. Ready to open up to the joy of tenting again? Come by one of our shops to talk to the experts and learn more about which RTT is right for you. Not ready to commit to tent life? We also have Burmis tents available for rent, so you can try them out before you buy.